“Just Saying … ” Didn’t I just use this line yesterday posted here. The philosophers said it weakens the argument. So, at the end of the day, what gives? An anxious couple complained to the Master that their son had abandoned the religious traditions of the family and proclaimed himself a freethinker. belongs.” Anthony de Mello, S.J. Morsel: Do not fear the winds of adversity. Remember: A kite rises against the wind rather than with it. 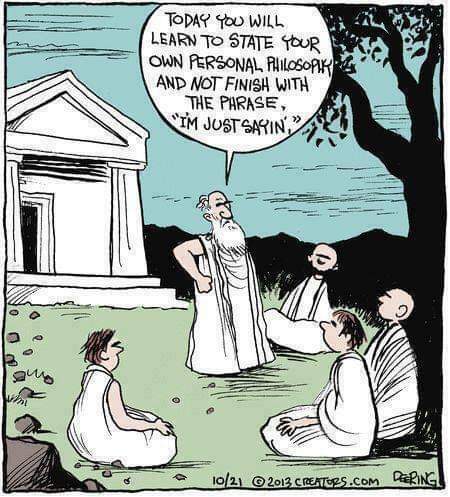 This entry was posted in Sunday Snippet and tagged Cartoon, Comic, Humor, Just Saying, Manners, Philosophy, Sunday Snippet, What Matters by Perpetua. Bookmark the permalink. I used to read De Mello all the time. I had forgotten his great wisdom. Thanks for the reminder.